Raphael points out that the iPhone 3G is mostly around for nostalgia, although it probably continues to have use for testing purposes. This is a great setup that closely resembles my own, and if you frequent our weekend Mac setups posts, you’ll notice a strong trend of laptop based workstations, where the primary machine is a MacBook Pro or MacBook Air connected to an external display and a keyboard and mouse. Other than the obvious portability aspect, the major advantage to using a Mac laptop is the ease of which a dual-screen setup is immediately possible just by connecting an external display. Maybe it’s just our readers who are inclined to do this, but speaking from experience, it’s a great way to boost productivity. 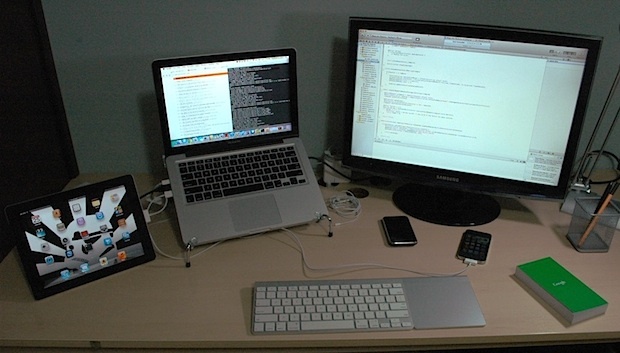 Send in pictures of your own Apple & Mac hardware setups! Email to osxdailycom@gmail.com and include some brief details of the hardware and what it’s used for. There is no such thing as a Mid 2011 MacBook Pro. Early 2011 and Late 2011 only. He probably bought it in middle of 2011, meaning its an early 2011. There really wasn’t a big change between early and late 2011 anyway, so no harm no foul. I second the external monitor recommendation though, it’s essential for the 13″ and 11″ models especially.